UHMW- PE, an engineering polymer is known for it’s multifunctional properties substituting alloy metals, steel, rubber, wood and other materials. Apart from its exceptional chemical resistance, water proffing, electrical and mechanical properties, UHMW-PE is best known for it’s abrasion resistance, self-lubricating and food grade properties. 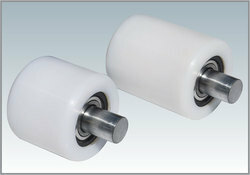 For example idler or conveyor rollers need all the above mentioned properties specially abrasive resistance. Furthermore, UHMW-PE is self lubricating material so does not need any external lubricating oil or grease and hence it is most desirable for machine gears and conveyors. It’s impact strength is very high so it’s most suitable for marine fenders and textile loom pickers and machine spare parts. Furthermore, UHMW-PE is self lubricating material so does not need any external lubricating oil or grease and hence it is most desirable for machine gears and conveyors. It’s impact strength is very high so it’s most suitable for marine fenders and textile loom pickers. Below is a comprehensive list of popular applications of UHMW-PE. Engineering / Machinery: Star Wheels, Conveyors, Guide Rollers, Screw Conveyors, Check / Water Stripes, Scraper, Deflecting Blades, Knives, Coater, Sliding Rails.